Yesterday's most talked about show was no doubt, Tommy Hilfiger. His Fall 2015 collection, which also doubles as the 30th anniversary of the powerhouse, was an ode to Hilfiger's All-American, iconic brand. With what else other than football and the country's expressive period of the 70s? 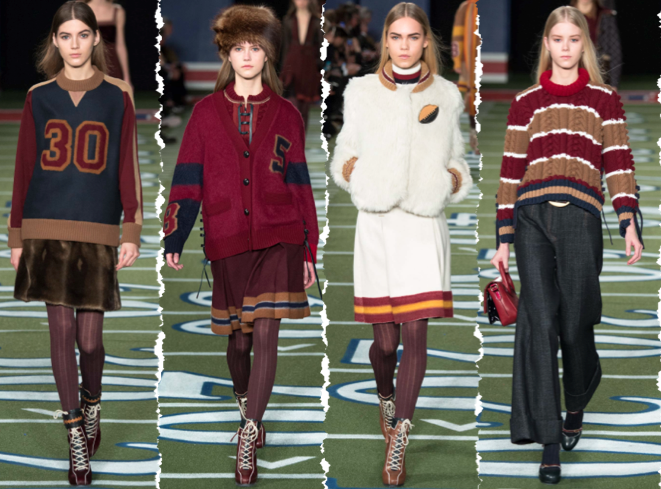 The runway turned stadium was the perfect setting to the old-school prep attire that was mixed with nouveau Letterman jackets, toggle-coats, and rich knits colored cognac and camel that resulted in a unique and relevant nod to the 70s-prep of Ivy League Friday night lights. The models (which included an impressive team of Gigi, Jourdan, Liu, and co.) sported Ali McGraw inspired hair and makeup which added a California touch to the collection. As the collection was inspired by America's favorite pastime, the football lace-up booties are sure to become the next "It" thing. Tommy's (field) goal for the collection was to take something from the past and apply it to what works in fashion today. In this case, we see who the new QB is.